The golden moons pass by once every million years. Their golden light is so magnificent that some swear it grants wishes. If you happen to be lucky enough to witness the golden moons, wish for them to pass by again soon. Sharks and Dolphins can be best friends. 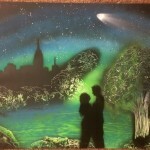 This painting has a special symbolic meaning. From the grace of a dolphin within her and the strength of a shark within him, this romantic couple is perfect together. The sun is our life source. It gives us light, heat, and ultraviolet waves. Without it, we could not possibly survive. 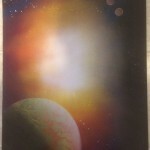 This painting is of our glorious sun. 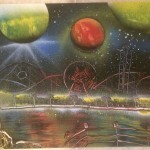 Theme parks are not only fun and exhilarating but can be very romantic places to take that special someone. 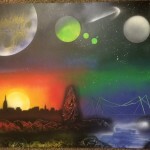 Here are three spray painting variants of the Disneyland California Adventure Theme park. Off in a distant solar system sits this spectacular view of asteroids passing between the homeworld planets of the ZinWek. The asteroids have made their cycles for millions of years without any collisions but some seers prophesize one day that will change. 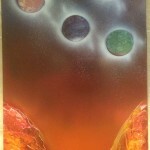 In a galaxy far, far away, lives a star with beautiful planets orbiting it. 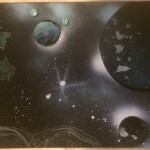 Take a trip to another world with Fantasy Spray Paint Art. Deep within our galaxy resides a solar system with inhospitable planets. 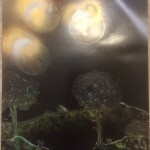 These planets have beautiful moons that orbit above the burnt wasteland. Such beauty undisturbed with no life within many lightyears to appreciate it. 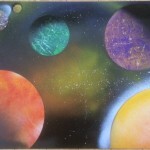 Get a glimpse of the marbled planets spray paint art.